Cartilage is the flexible connective tissue between our bones, and it is mainly based of cells called chondroblasts that secrete a gel-matrix made of collagen proteins. If cartilage maturation is disrupted, diseases may develop like the painful osteoarthritis and other chondrodystrophies. Therefore, it is important to understand the dynamics of cartilage formation and maturation, and a new reporter mouse made with classic pronuclear injection of the linearized product of a bacterial recombination of a BAC clone can help on this. need to kill animals for dissection diagrams. During cartilage maturation, the chondrocytes produce different types of collagen. Collagen, type 2, alpha 1 (Col2a1) is abundantly expressed in immature chondrocytes, but then is down regulated during maturation. In contrast, Collagen, type 10, alpha 1 (Col10a1) expression is absent in immature chondrocytes, but becomes highly expressed in mature hypertrophic chondrocytes. By following in real-time the expression of the two collagens in the developing bone, one could have an idea of the dynamics of cartilage maturation. This approach has been taken by Peter Maye and colleagues from the School of Dental Medicine (University of Connecticut) who developed a double transgenic reporter mouse in which collagen 2a1 promoter drives the expression of a cyan fluorescent protein (Col2a1-ECFP), and collagen 10a1 promoter drives the expression of a red fluorescent protein (Col10a1-mCherry). 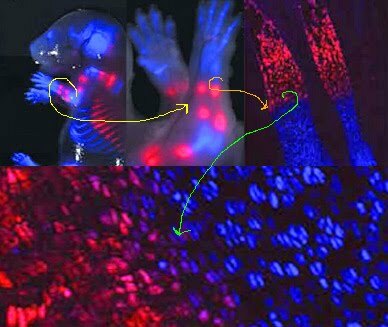 In a report published on Genesis, the authors illustrate how the fluorescence of the two reporters can be spectrally discriminated in vivo to efficacely monitor cartilage development. In the picture of a developing foetal mouse, long bones are maturing with extremities being the main center of ossification, while in the middle of the two extremities, cartilage is already differentiated. Conversely, the ribs are maturing following a dorsoventral pattern. Increasing the microscope magnification, it is possible to monitor single cartilage cells and identify the exact time at which an intermediate region switches its differentiation program.